As much planking as can be done on the mold is now complete. The rest is easier done with the canoe off of the mold. 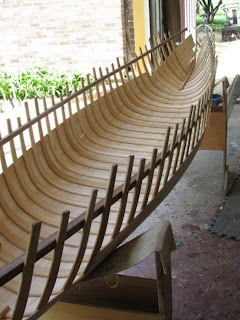 Its always a thrill to take a new canoe off, that is when it ceases to be a bunch of wood on a mold and starts to take on its new life as a canoe. With the canoe off the mold it is time to close up the ends. 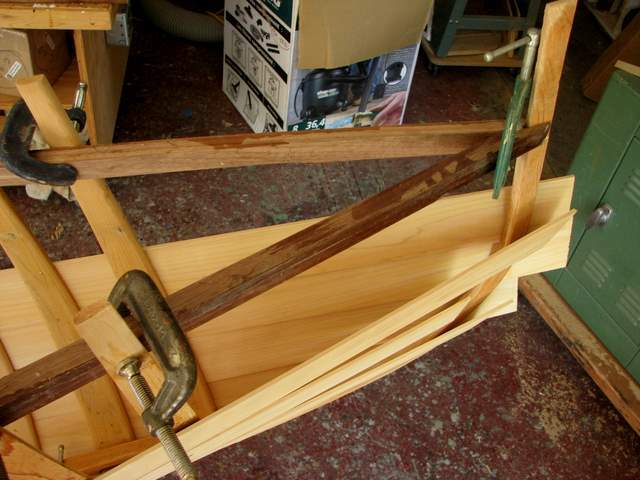 The first thing is to clamp the last ribs in place and to fit and trim the stem down so that I can fit the decks. Posted by Doug Ingram at 10:53 p.m.